The G20 kicked off today by slashing phrases about financing climate change reduction from a draft communique, an official told Reuters. The resistance reportedly came from the U.S. and Saudi Arabia, and the statement will be issued Saturday. (Note, this is the G20 meeting on finance with central bankers in attendance — the heads of state G20 meeting is scheduled for July in Hamburg.) 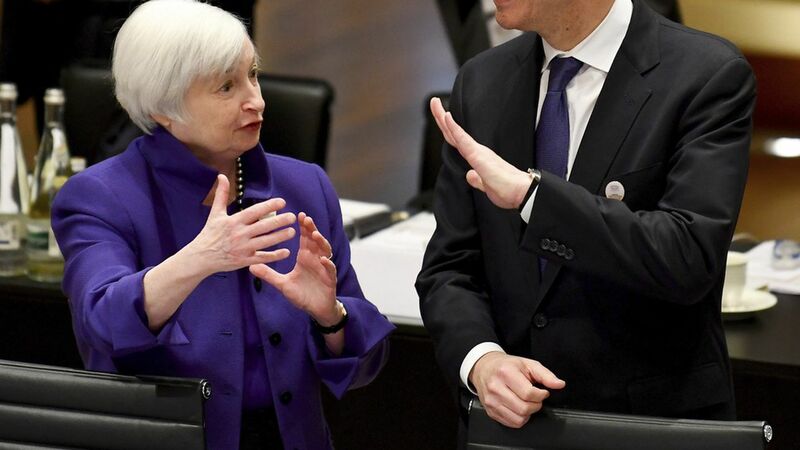 Steve Mnuchin and Janet Yellen are in Germany for the meeting today. QuoteClimate change is out for the time being. Why this matters: This is a drastic step back from what the Paris Climate Accord achieved. The last time the G20 financial leaders met in 2016, they urged Paris Accord signatories to bring the deal into force quickly and urged wealthy countries to contribute their 100 billion USD annually to cut carbon emissions. The Trump effect: Recall, yesterday OMB Director Mick Mulvaney said on climate change: "We're not spending money on that anymore. We consider that to be a waste of your money." Germany holds the G20 Presidency, and German Chancellor Angela Merkel is in the U.S. today meeting with Trump. In their joint presser, climate change did not come up, but it is unclear whether it's a part of their closed-door meetings today.